So a week has passed and we’re here again. Balloons on the posts, clear entrance/driveway; they have surely opened to Baguio’s dining public. (“,) We took a seat at their main dining nearest the kitchen window where the orders come out. I took a fettuccine and ate it before I tossed the pasta in with the saucy beef strips. Ohh, fun; al dente and perfectly seasoned. I could eat the pasta alone. It was like a light aglio olio … light aglio, more olio. =D With everything mixed together, the salty zingy flavor the Espagnole sauce had was toned down. I was also glad for the little bursts of freshness that the alfalfa side dish/garnish offered to this tender beef and pasta dish. Race’s pork and dagger ribs was a sight to behold with its huge chunk of pork. Nice and smoky, he said. Good and tender, too, but he thought it needed a little more spice, considering it did say 10 spices on the description, so he started looking around if there’s Worcestershire sauce … somewhere. Seeing no condiments, we kept munching along. \m/ I especially enjoyed the side salad in his plate which was made up of pickled turnip and carrot sticks. Somehow, I twirled and I twirled pasta around my fork and I was left with only strips of beef, bell pepper and onions in sauce. Race finished his rice and he still had some pork to finish off. We got an extra order of mashed potatoes to help us clean off every bit of ‘ulam‘ on my plate. Interesting, the mashed potato sort of took on a cheesy taste with the beef stroganoff. NYUM! Service: Hopefully, staff improve their peripheral vision as many more days of their resto operations come and go. 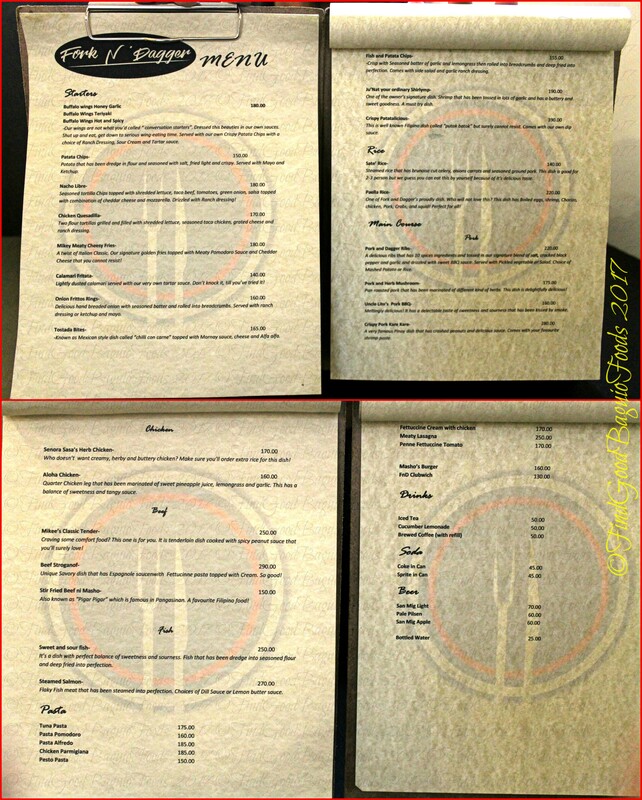 Matapos ang post ng mga menu ng bagong paglalafangan may feature naman bago ulit. Fork n’ Dagger parang cloak and dagger. Bet ko yun shirt mo ha. I was thinking the same thing. Asked why Fork ‘n Dagger though, it’s just because they’re going to have a lot of meaty slabs to offer so we’re all going to need a fork and knife for carving the meat. The pasta was well made and well seasoned. WOW kakakita ko lang to sa Facebook navisit na ninyo. The Tangay Tangay Eatery is gone? 😦 It’s good Fork n Daggers seems like a good restaurant. Hello there, Stellah! I was a little crestfallen when we arrived at Nevada Square and they directed us to where Tangay Tangay was. But yes, we’ll take solace in the idea that it was replaced by a good resto in Fork and Dagger. Servings were pretty big. Some of our foodie friends were raving about the plate sizes and portions they got. We did enjoy our food so. Hello there. Aww, bad timing. Fork n Dagger posted on their page that they’d be closed. Needed a breather from the opening hustle, I think.